Smile Enhancement or Makeover using all porcelain veneers and crowns available at BrightSmile Dental & Aesthetic clinic. We offer 0% interest finance on treatments subject to status, please call us on 02074311444 for more information. 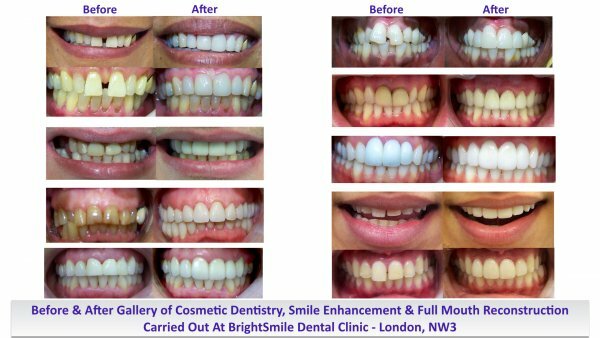 Smile Enhancement using 10 porcelain veneers carried out at BrightSmile Dental & Aesthetic Clinic. We offer 0% interest finance on treatments over £1000, please call us on 02074311444 for more information. 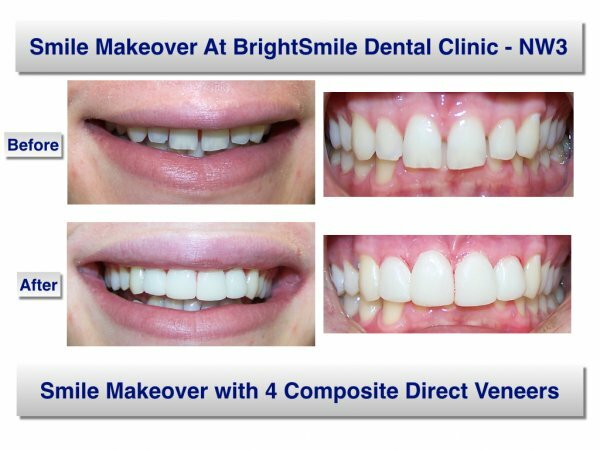 Smile Makeover using composite direct veneers available at BrightSmile Dental clinic. We offer 0% interest finance on treatments over £1000, please call us on 02074311444 for more information. Before & After pictures of a smile enhancement & gap closure by 4 composite direct veneers carried out at our Finchley Road, NW3 Dental Practice. Before & After pictures of full mouth reconstruction, smile enhancement & cosmetic dentistry carried out at our Finchley Road, NW3 Dental Practice. Before & After photos of dental and cosmetic work carried out by the principal dentist Dr. Massoudi at our dental clinic in NW3, Finchley Road, Swiss Cottage area, are now available for vewing on our website.